This article is the fourth in a series of counter-Bicentennial pieces dealing with the more sordid and often less-acknowledged incidents in America’s 200year-old history. As discussed in last month’s issue of the Fifth Estate (see Bicentennial Moment No. 3, “The Ludlow Massacre”), the period beginning in 1865 with the conclusion of the Civil War and continuing through 1919 marked the turning point in America’s economy from individual, agrarian-based capitalism to corporate monopoly capitalism. With the end of the war, free blacks and an influx of newly-arrived immigrants flocked to join their brothers and sisters in industry. Delighted by the deluge of new wage slaves into the labor market, the big bosses took advantage of the situation and promptly slashed wages and expanded working hours to anywhere from eleven to fourteen a day, often requiring six-day work weeks to boot. Great fortunes were being made from the country’s seemingly limitless supply of natural resources, yet great numbers of Americans were living on the knife-edge of poverty. It was out of this pivotal period that national labor organizations first began picking up strong worker support. Out of this period also emerged the roots of May Day and the first steps on the bloody road to the Haymarket Square Riot of 1886. Although the Eight-Hour Day Movement wasn’t to gather a massive following until 1886, Eight Hour Leagues were established as early as 1829. By the middle of the century, Grand Eight Hour Leagues were formed in principal cities and manufacturing centers in the North. The demand became increasingly more vigorous after the Civil War as workers came to realize that only through their solidarity could they hope to wage war against monopoly capitalism. Actually, sufficient force had been garnered to pressure the federal government into passing an eight-hour day law for its own employees in 1868, but the laws were predictably full of loopholes and thus not enforced. For the next few years, workers’ living situations appeared to be improving, if only slightly. Trade unions and co-ops were being set up by bakers, shoemakers and printers among other small businessmen and profits were divided as well as eight-hour days implemented. Causes for optimism weren’t destined to last long, though, as a depression brought on by over-extended production hit hard in 1873. By 1877 more than three million Americans were unemployed and those lucky enough to be working found their wages reduced by as much as 45%. Anger and resentment on the part of the workers grew daily until it finally spilled over onto the streets in 1877, the year of the “Great Upheaval.” Railroad workers in Martinsburg, West Virginia fought armed battles with police and militiamen as they protested depression wage cuts and soon workers in mines and mills throughout the Country joined railroaders in refusing to work. Although the spontaneous strike was eventually quelled, it left the American worker with a new-found sense of power. By 1886 conditions again had changed. The depression had ended and combined with the recovery of business, worker resistance switched from the concern over wage cuts to the thirst for control over issues such as hiring and firing, the power of foremen and superintendents and the hours of labor. With the coming of the age of machinery in the 1880’s, America saw a massive increase in unskilled and semi-skilled workers. The surplus of labor expanded dramatically as the population shifted from the country to the city and the entry of immigrants achieved its peak. Consequently, with the workers’ lack of organization negating any bargaining power they might have had, the bosses found it relatively easy to keep wages down and retain long hours of work. At the time there was one widespread labor organization which did exist, the Noble Order of the Knights of Labor (an organization which had existed as a secret brotherhood from 1869 through 1881), but its leaders were nowhere near progressive enough to fight for something thought to be as revolutionary as an eight-hour day. Being that the Knights of Labor failed to head up the struggle, it was left to the weaker Federation of Organized Trades and Labor Unions (the forerunner of the A.F.L.). At its Chicago convention on October 7, 1884, a resolution was passed demanding an eight-hour day from May 1, 1886 on. Workers throughout the country responded enthusiastically. Ironically enough, workers joined the Knights of Labor in droves as the May 1st deadline grew near, driving its membership up from 989 local assemblies and 104,066 members in July, 1885 to 5,892 assemblies and 702,924 members in July 1886. Like it or not, the organization found itself at the core of the eight-hour day movement. Fearful of the condemnation of churches and newspapers it was receiving, the Knights attempted to suppress the movement and withdraw from it completely in 1885. At the time, however, unaware that their leaders had already backed out, at least 190,000 workers struck for a shorter day on May 1st while another 150,000 secured demands merely on the threat of a strike. As the Eight-Hour Day Movement gained momentum, the Chicago anarchists took to it as a common labor front and as part of the class struggle. Embracing a combination of anarchism and syndicalism, which became known as the “Chicago Idea” under the guidance of Albert Parsons and August Spies, the Chicago group resisted Johann Most’s preoccupation with individualistic acts of terrorism in the Eastern states. Rather they saw the trade union as the “embryonic group” of future society and as the primary fighting unit against capitalism. Due mainly to the long history of police brutality in Chicago, the city had more than one-third of the International Working People’s Association (better known as the Black International) members as well as five anarchist newspapers–Alarm, in English; Chicagoer Arbeiter-Zeitung, Fackel and Vorbote in German; and Budoucnost in Bohemian. As its leaders, the Chicago group had Parsons, Spies, Samuel Fielden and Michael Schwab. By 1884 the anarchists had penetrated the trade union movement. The Progressive Cigar Makers Union called for like organizations in the city to secede from the conservative Amalgamated Trades & Labor Union to organize a militant Central Labor Union. Four did secede (the metal workers, butchers, carpenters and cabinetmakers) and by April, 1886, the CLU had overcome its rival with 22 unions, 11 of which were the largest in the city. As the CLU grew, so did its agitation for an eight-hour day. As planned, on May 1, 1886, workers began walking off their jobs; 40,000 went on strike immediately and within a few days the figure had jumped to 65,000. Another 45,000 were granted a shorter day by their bosses without having to strike. As worker solidarity increased, leading businessmen and manufacturers got together in an effort to crush the Eight-Hour Day Movement. Among those who combined their efforts were the chief iron and steel foundries, the copper and brass companies, the planing mills, lumber yards, box factories and the Western Boot and Shoe Manufacturers, who represented another 220 firms. United, these organizations declared they’d grant no concessions to the striking workers. Despite their influence, however, the workers still managed to tie Chicago in knots and virtually bring the city to a standstill; at least until the police intervened on behalf of big business to break up meetings and processions. On May 3, two days after the strike began, the first wave of violence hit. As August Spies spoke before 6,000 striking lumbermen at a Chicago rally, 200 broke off from the crowd and marched to the McCormick Harvester Works to heckle scab labor. Upon their arrival they were met by 200 police. The striking lumbermen listening to Spies heard gunfire coming from McCormick’s and rushed to the aid of their comrades, only to be met by still more police, who fired into the crowd killing four and wounding many others. “The masters sent out their bloodhounds–the police; they killed six of your brothers at McCormick’s this afternoon. They killed the poor wretches because they, like you, had the courage to disobey the supreme will of your bosses. They killed them because they dared to ask for the shortening of the hours of toil. They killed them to show you, ‘Free American Citizens,’ that you must be satisfied and contented with whatever your bosses condescend to allow you, or you will get killed! … If you are men, if you are the sons of your grand sires, who have shed their blood to free you, then you will rise in your might, Hercules, and destroy the hideous monster that seeks to destroy you. To arms we call you, to arms! On May 4 at 7:30 p.m. some 3,000 people were assembled at Haymarket. Even Chicago’s mayor, Carter H. Harrison, was in attendance to see to it that the demonstration was peaceful. Through the first two speeches by Spies and Parsons, all was peaceful. Satisfied, Harrison left. Then, without due provocation, as Samuel Fielden was working toward the close of his speech, Inspector John Bonfield (who had a reputation for his extreme brutality) led a detachment of 180 police into the meeting to break it up before its end. As Captain Ward commanded the meeting to disperse, someone south of the speakers’ wagon pitched a bomb into the mass of police, killing seven and wounding another 66. The police immediately opened fire on the crowd killing several and wounding an additional 200.
Who threw the bomb? Although there’s never been a definitive answer, there were three credible theories advanced. The first was that the bomb was meant as reprisal for the numerous instances of brutality perpetrated by Bonfield and the police department. The second was that an agent provocateur threw the bomb to stir up public hatred against the Chicago anarchists. The third was that Rudolph Schnaubelt, an anarchist and brother-in-law of Michael Schwab, threw the bomb, which had been made for him by fellow anarchist Louis Lingg. Whatever the motive, the damage had already been done and the Chicago press reacted instantaneously with hysterical cries for immediate indictments and the execution of all subversives. “These serpents have been warmed and nourished in the sunshine of toleration until at last they have been emboldened to strike at society, law, order and government,” wrote the Chicago Tribune. Within a few days, all the major anarchists and subversive elements in the city–save for Albert Parsons, who’d disappeared–along with 25 printers of the Arbeiter-Zeitung, were arrested. On a rampage, the police seized the subscription lists of the paper and made a series of raids of meeting halls, printing offices and private homes, seeing to it that they found, and made public, discoveries of ammunition, rifles, swords, muskets, pistols, bayonets, billy clubs, anarchist literature, red flags, incendiary banners, cartridges, bullets, bulk lead, bullet molds, dynamite bombs, shells, percussion caps, material for making torpedoes, secret trap doors and underground rifle ranges. It was later established that a concerted effort by Inspector Bonfield and Captain Schaack of the Chicago Police Force existed to sustain public fear and hatred towards the anarchists. According to another member of the force, once the subversive societies had been broken up by police, Schaak wanted to send out undercover men to form new organizations. In mid-May a grand jury convened and hurriedly issued indictments against August Spies, Michael Schwab, Samuel Fielden, Adolph Fischer, George Engel, Louis Lingg, Oscar Neebe and Albert Parsons, who walked into the courtroom and gave himself up the day the trial began. From the start it was evident that the trial would be a farce–a total travesty of justice. For one thing, Judge Joseph E. Gary forced all eight defendants to stand trial as a group, thereby increasing the risks. For another, the jury was packed by the prosecution. Instead of the names being drawn from a box, a special bailiff nominated by the State Attorney was appointed to select the candidates and he was heard to have said he’d see all eight hang. In time, many of the prospective jurymen came to admit their prejudices against the defendants, yet Judge Gary pronounced them fit for duty. Of the twelve finally selected, the choice was so ludicrous that one jury member was actually a relative of a Haymarket casualty. From the direction the trial took, it was obvious the eight were on trial more for the ideas they held than for the Haymarket incident. The prosecution was not beyond attempting to fabricate evidence via unreliable witnesses and unsubstantiated information. The police offered contradictory statements as to whom among the eight defendants fired shots at them and a professional liar was even employed by the prosecution at one point. Paid informants were hardly a surprise. The defense, on the other hand, wasn’t allowed to introduce testimony concerning the theory of anarchism in its behalf, yet the prosecution was able to read inflammatory passages from Alarm and Arbeiter-Zeitung at will. The police exhibited bombs and dynamite as evidence, yet neglected to mention that the materials were found miles from the scene of the crime. On August 20, all eight defendants were found guilty. On October 9, seven of the eight were sentenced to death by hanging and Oscar Neebe was given fifteen years. A bid for a new trial was summarily denied by Judge Gary. Out of this repulsive mockery of justice came three days of eloquent, moving summation speeches by the convicted anarchists. The case ultimately went to the Illinois Supreme Court in September, 1887 for consideration, and although the Court admitted that a multitude of legal errors were committed in the case, it upheld the decision of the lower court. Labor organizations across the country pleaded for mercy for the condemned and in the end, Fielden and Schawb appealed for, and were granted, a commutation of the death sentence through executive clemency. The others demanded liberty or death and, with the exception of Louis Lingg (who blew himself up in his cell with a dynamite tube in his mouth the day before the execution), all were hanged. The conclusion of the Haymarket Square case in 1887 pretty much signaled the end of the Eight Hour Day strike. Public opinion began to run heavily against the movement and the working population was split. The police used alleged bomb plots to harass and attack any strike gathering and labor leaders were seized and jailed. Clearly the momentum of the strike had been dealt a death blow by the Haymarket affair and within a week of its wrap-up, workers began to return to their jobs. Many returned to find their former positions now occupied by scabs. While 42,000 of the original 190,000 strikers won their demands and another 150,000 achieved concessions without having to strike, once the energy and enthusiasm of the movement was spent, employers retracted those concessions and conditions returned to what they’d been before. Still, the workers movement continued and the first of May, May Day, became an international workers’ holiday inspired by the solidarity of the American workers. Beyond the Eight Hour Day Movement, most radical theory and practice fell out of favor with organized labor. The Black International was whittled down to a small group of intellectuals as it was shunned by workers. 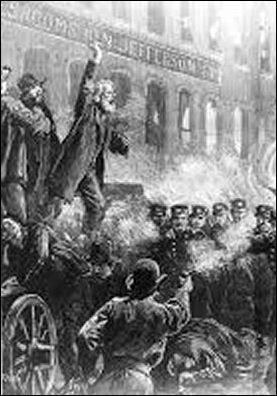 Radical factions in America were slow to recover from the Haymarket period of persecution, especially the anarchists, who lost their hold on the U.S. labor movement. Workers instead turned to the more conservative American Federation of Labor for its energetic role in the Eight Hour Day Movement and its resolution for clemency for the eight Haymarket defendants. The Noble Order of the Knights of Labor, for its official treachery in the strike and its refusal to petition for the pardon of the eight, was abandoned. Root & Branch: The Rise Of The Workers’ Movements, edited by Root & Branch, Fawcett Crest, 1975.